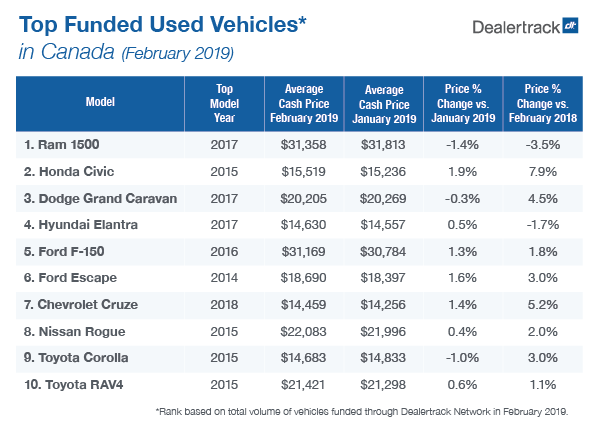 Mississauga, Ont.—March 15, 2019—After two consecutive months of relatively flat results, overall pricing for the Top 10 Funded Used Vehicles* rose last month in Dealertrack Canada’s online credit application network. Based on data collected from Dealertrack — Cox Automotive Canada’s Retail solutions brand — overall Average Cash Prices of the top 10 vehicles saw a year-over-year (YOY) increase of 2.3%. This reflects a jump from $20,071 in February 2018 to $20,422 last month. As such, eight of the Top 10 Funded Used Vehicles saw price increases compared to 12 months earlier. Although seven out of the 10 vehicles on the list saw Average Cash Price gains on a month-to-month (MOM) basis, overall prices in February 2019 remained relatively natural compared to the previous month, with only a 0.5% gain. Regarding price gains, the second place Honda Civic led the way in February. The repeatedly best-selling compact passenger car saw its price go up to $20,205 last month, a modest 1.9% monthly yet substantial 7.9% annual gain. Whether looking at the Dealertrack network data on an annual or monthly basis, the first place Ram 1500 full-size pickup recorded the most substantial Average Cash Price loss in February. On a MOM and YOY basis, the Ram truck fell 1.4% and 3.5%, respectively, to $31,358. Also noteworthy in February, the Toyota RAV4 slipped into the final spot on the Top 10 Funded Used Vehicles list. With gains of 0.6% compared to the previous month and 1.1% annually, the Average Cash Price of the Toyota compact crossover rose to $21,421. 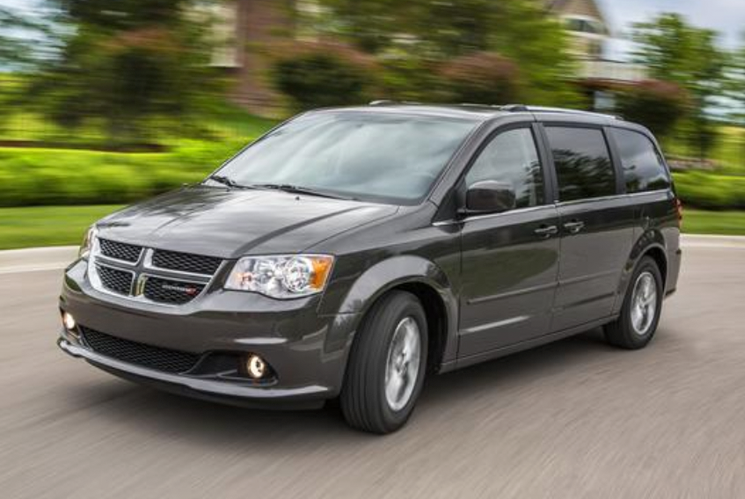 The popular compact crossover bumped the $18,744 Dodge Journey mid-size crossover to eleventh place overall. Dealertrack is the leading provider of web-based software solutions and services for all major segments of the automotive industry, and Canada’s largest and most accurate source of automotive retail sales data. Because of this, Dealertrack clients benefit from having access to Customized Dealertrack Dealer Reports that consolidate a vast amount of non-personal demographic information, market trends and preferences from the Dealertrack online credit application network. For example, dealers need to stock the right vehicles at the right price for the right customers. 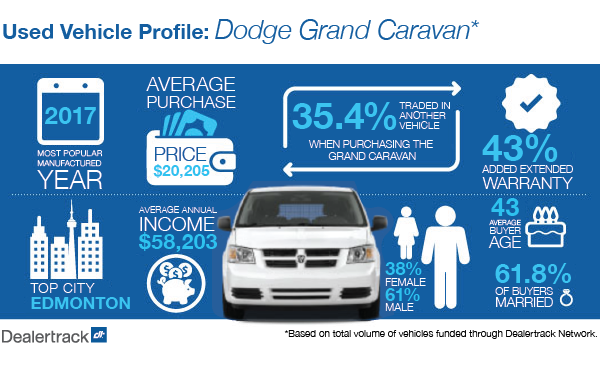 Based on social, geographic, financial and economic demographic data—from the Average Cash Price to the age of the average buyer to their marital status — garnered via the Dealertrack online credit application network, by tapping into Dealertrack’s deep data, dealers can create an inventory that’s right for their market and their business. In Canada, over 5.2 million credit applications are submitted annually through Dealertrack Network for vehicle financing. Our reports are designed to leverage this information and provide insights to help Canadian automotive dealers, lenders, OEMs, third-party retailers, agents and aftermarket providers identify opportunities to improve business results. Want to see the full top funded used vehicle report or learn about other reports available from Dealertrack Canada? Call us at (866) 830-3863 or email us at [email protected]. *Based on the total number of funded through the Dealertrack Canada online credit application network.